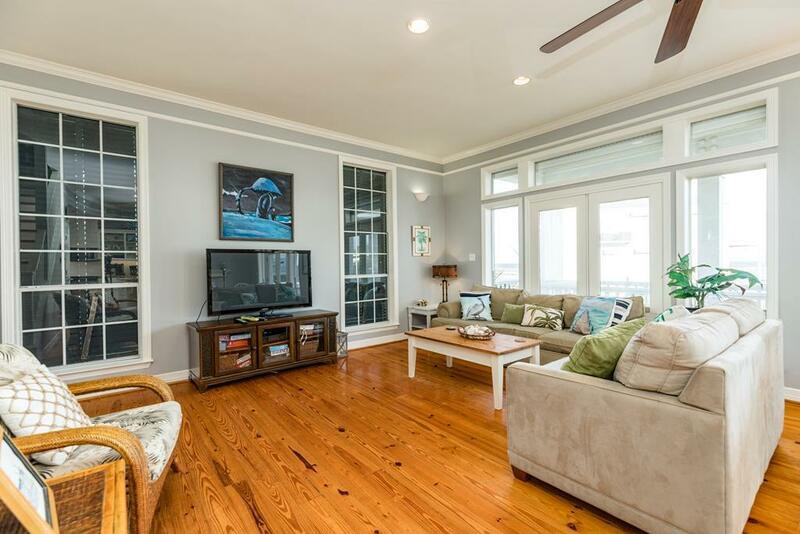 2nd row, 2 decks, Gulf views from every bedroom & a wood fireplace in the open living area! This vacation rental is great for couples or small families vacationing together with a king-sized master suite, 3 queen bedrooms, and a loft with a pyramid bunk & twin trundle. 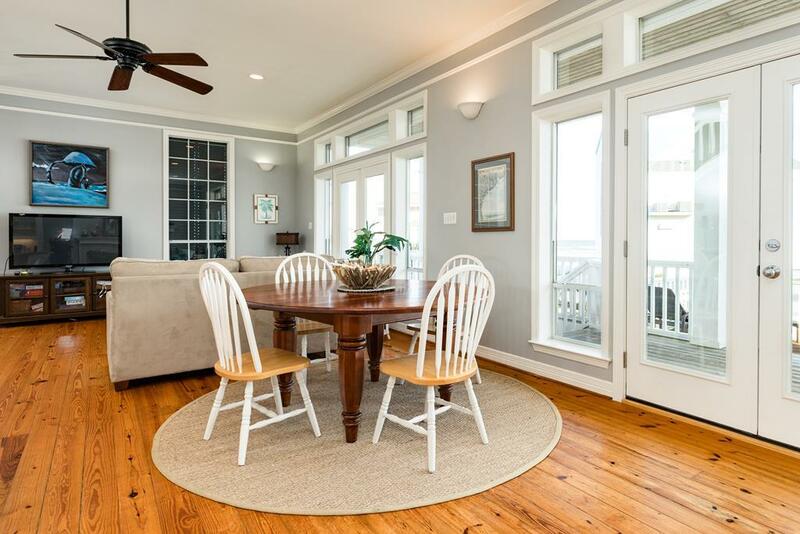 Hardwood floors, high ceilings, and elegant molding details add that special touch to the open living/dining area while the spacious kitchen features a great island with plenty of storage space for your beach snacks. Step out onto the deck for great views and Gulf breezes or make the short walk to the neighborhood beach access! Palmetto is a fantastic house for just adults. The 4 private bedrooms with larger beds works great for adults only. This is our 2nd year in this house. The neighborhood was safe and quiet. Very well designed and located for a medium sized group. Beautiful, spacious home with an amazing view of the gulf! Improvements have been made since last time we rented this home. New access to top floor from outside and plenty of outdoor furniture. This is the second time we rent this home. It makes my family feel at home even if it was for a couple of days. Palmetto is an excellent beach gone for vacation. We rented the home for the Lone Star Rally. We had three couples and a single. Each room having a queen sized bed made the house work out great. Everyone loved that each bedroom had it's own balcony doors. We found a few issues at first, nothing major, called the office and a maintenance service technician arrived promptly. Not too far from town, just enough for a good bike ride back. This is an awesome home, very close to the beach with a great view from all rooms, and the living/dining area is bigger than I thought from the pictures. Would definitely rent again. Only one negative comes to mind: there were 4 couples in our party and the 3 bedrooms on the top floor that are supposed to be queens seemed smaller than advertised. Other than that, we had a great time in this home. Provides very good facilities for our group. Access and service are reasons we continue to use this property. Great home, spacious front room, great decks. beautiful home! great ocean view! had a great time! The house was so charming and had plenty of room to accommodate my guests. The view of the beach was beautiful! Our family takes a vacation every summer and this year we choose the beach. My experience as a first time guest booking was awesome. The entire process from booking to checking out was great, fast, and excellent customer service. Palmetto beach house was exactly how it was described. Modern, clean, and refreshing views of the ocean. It was 11 of us including 4 children. Everyone slept comfortably with space left over. Overall, really great experience staying at Palmetto. We will definitely be back!! Loved this beach house. Our family of 11 stayed for a week in August. The house was in great shape, close to the beach, and able to view our beach canopy from the deck. Great propert for large family. Palmetto was the perfect house for our large family! Every bedroom has a wonderful view of the beach. Can't beat that! The house was beautiful and spacious. Perfect for my father's 80th birthday celebration! Had a great view of the beach with easy access. Of course, it helped that the weather was also perfect! Would definitely stay again. Palmetto was a great house to stay in! It really works for large groups of couples with 4 bedrooms with queen or king size beds. It was minutes from the beach and very quiet. We stayed during September and had the whole beach to ourselves it seemed. Weather wasn't great but house was great for games and good conversation inside and out. We will be back! This was our second year of staying at Palmetto. The house is perfect in size and location for our entire family. It truly has become a house of wonderful memories that our children will continue to look forward to for many years. A beautiful home, comfortable and attractive furnishings and great view. Excellent beach house for our family vacation! Gorgeous house - Living area and kitchen are open and great for entertainment - very spacious. Huge round table for eating and playing cards or games. Love the floor plan! Master is down with master bath. All other bedrooms are upstairs (3 bedrooms and loft with daybed and bunk beds) - so basically it's 5 bedrooms . . . 2 full baths upstairs and 1 has a bath tub, the other a large walk-in shower. All bedrooms have doors with access to the deck. Loved this house so much we stayed last year and this year! 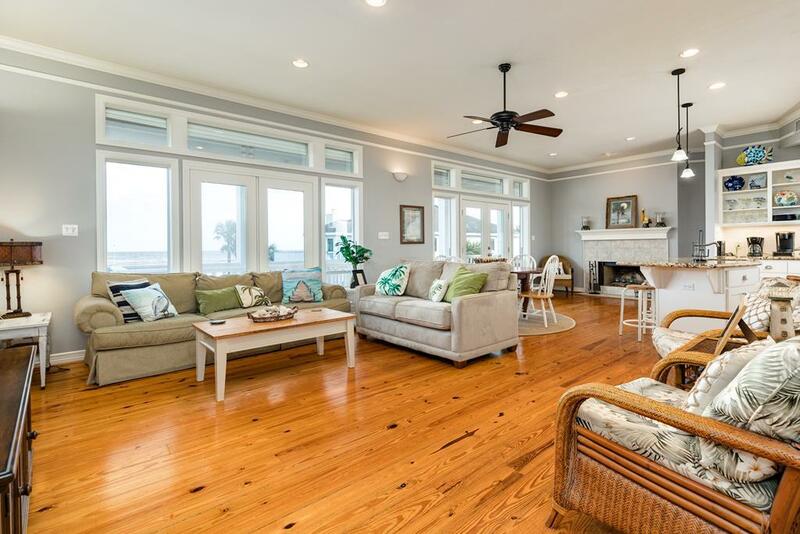 Palmetto is a beautiful home on a quiet beach with larger than normal lots. We were practically the only ones there in Sept. The house is beautifully furnished, comfortable, large and very comfortable. The people at Sand n Sea are very helpful and professional and really try to accommodate requests. Palmetto remains our favorite house! We have stayed here several times and for our family it always feels like we are coming home. This was an awesome house. Lots of room...great view of the beach...highly recommend! Loved it, loved it, loved it! Very nice and accommodated us all very well - plenty of room. Great floor plan. It's 4 bedrooms, but since you have the loft with bunk beds & a day bed its actually 5 bedrooms. Very close to the beach. Kitchen is updated with granite and stainless steel appliances. Location of the master is downstairs & private. Loved all the family pictures, & how it was decorated! Great view & loved the extended deck facing the water! The only thing we did not like is although we had access to the country club pool, they may charge you $5.00 a head each day to use. I could see $5.00 per family, but thought this was a little extreme. We were told they sometimes let you in without charging, but are not consistent. We did not even go to the pool because of this. Will definitely stay here again!!! Super view of the ocean. Love the covered decks. Each guest bedroom opens onto upper deck so everybody gets a great room & view. The house itself was very lovely and comfortable. The gate on the deck made us a wee bit nervous with little ones toddling around (there isn't a way to lock it). And the openings in the railings were a width that they could definately squeeze their way through so we had to avoid the deck with little ones (some decks have a wire material woven through for extra protection). Everything was updated, the beds were comfortable, and the space was just perfectly layed out. The kitchen did seem to be missing some items like dishcloths and a dustpan (we bought one and left it there). We wanted to tidy up after ourselves but it was hard without a dustpan. The proximity to the beach was super close and having a shower downstairs (although the concrete is smooth and we had 2 slips because it was wet after the shower) helped us keep the sand out of the house. The WIFI did not work properly enough to be considered an amenity (we had 2 men needing to check in on work and had to drive to Starbucks) and I think they should note the baby gate, pack n play, and rocking chairs in the amenities for families traveling with little ones. Taking all of this into considertaion, I would still recommend this house to friends and family. Hello! We are glad you enjoyed your recent stay at Palmetto. We keep extra household supplies at our office (including brooms, etc) that we are happy to provide upon request - just give the office a call! Thank you for the feedback about the weak internet signal - we have made the necessary adjustments to the amenities this home includes. When you are ready to plan your next stay to the island just give us a call and we can direct you to the homes that do offer internet connectivity to guests. We look forward to seeing you again! Awesome property, perfect for our family. We vacationed with three grown daughters and their families. We took the master downstairs, and they each had their own bedroom with queen bed upstairs. The cousins loved sharing the upstairs landing with several beds there. One of the upstairs bathrooms has shower only and the other tub only. This worked for us but might be a concern for others. The downstairs bath has tub/shower combo, and has access from master or great room. The great room was large and spacious. The kitchen was well equipped. The views from patio and both decks were awesome. It is very close to the beach, and they have outside shower. Decor was attractive. 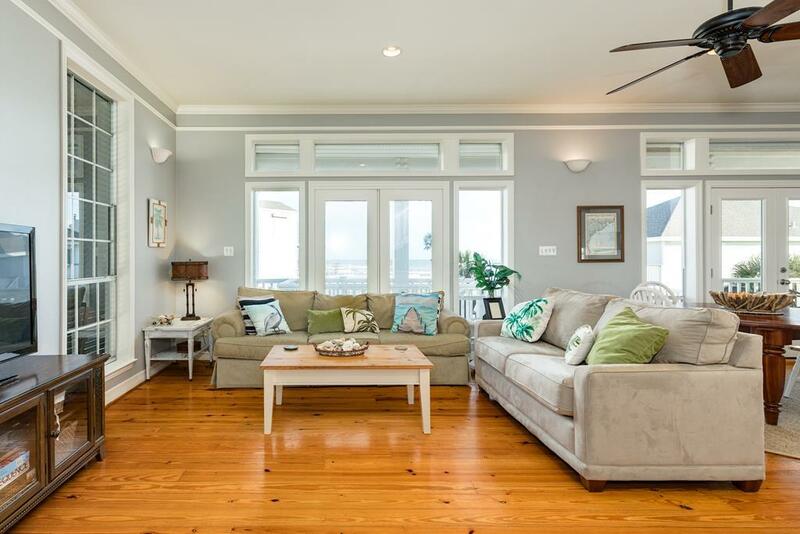 All bedrooms (and great room) have seaviews, and access to decks. Beds were comfortable. All bathrooms and closets were roomy. If you want less light or more privacy, the storm shutters come down easily. We got ten around the round dining table. 3 large flat screen tvs in great room, master bedroom and upstairs landing. Some games, movies, and books in the house. When we got there, there was no grill, and we called and they brought out a brand new one immediately. Neighborhood was quiet. Patio furniture plentiful, but mostly standard cheap plastic. Lower patio has swinging loveseat and picnic table. Palmetto is the perfect home for a family. All the adults had a queen or king bed and the kids loved the pyramid bunk and day bed. Excellent arrangement in the house as well. ALL bedrooms have a gorgeous view of the Gulf. It was the perfect home for our Family Vacation---we will definitely be back! Thanks Sand and Sea! We had a wonderful time together. This was a family vacation that we will long remember. Great house. Loved that it had 4 bedrooms with adult size beds and not bunk beds in bedrooms. Will stay here again. James and his family live near Galveston and I in Austin. We celebrated my 80 year old mother's birthday and also James 1yr old grandchild's birthday and our 1yr of meeting Anniversary. We had my family from Louisiana meet his family and it was an amazing weekend. The house was very nice and we had plenty of room for my family. It's just a few steps to the beach and the weather was wonderful. The house had anything we needed to make our stay pleasant.